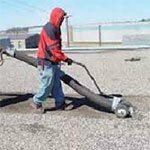 We provide Roofing Services For Commercial and Industrial Properties. 1. 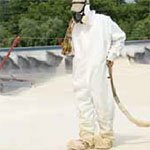 PREPARE ROOF SURFACE PER SPECIFICATION. 2. APPLY SPF WITH A MINIMUM THICKNESS OF ONE INCH. 3. COAT FOAM SURFACE WITH APPROPRIATE CONKLIN COATING SYSTEM. 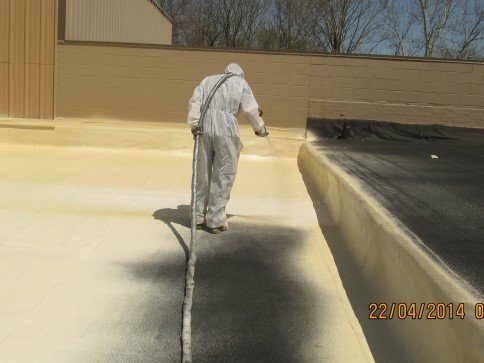 Conklin’s Spray Polyurethane Foam (SPF) System is a seamless barrier that increases energy efficiency by insulating and waterproofing the roof of your home or business in Salem, Seymour or Jeffersonville, IN, and surrounding areas. Conklin’s SPF Roofing System will deliver all these benefits on a new or restored roof for years to come. Increases energy efficiency and lowers utility expense witha cool, white, reflective survace and an insulation value of R-6.5 per inch of thickness. Stops lateral water movement with the foam’s close cell structure. Simplifies roofing repairs – most roof damage can be fixed with a caulk gun and coating. The average roof absorbs a large portion of the sun’s ultraviolet rays as heat. Conklin’s white SPF roofing system reflects 85% of the sun’s heat, cooling your building and saving you as much as 30% in air conditioning costs. Conklin’s optional warranty program includes a non-pro-rated material warranty. A great return on investment is another important reason to install Conklin’s SPF Roofing System. Many satisified builing owners discover that a Conklin roof pays for itself during the warranty period in lower air conditioning costs. Federal tax rebates, tax credits and deduction may also offset your investment. Check with you local utility company tax advisor and www.energystar.gove for additional details. 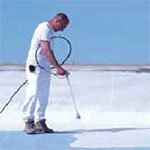 Superior Roof Restorations is a family owned and operated roofing company specializing in commercial roofing applications in the Salem, Indiana area. Since our beginning in 2008, we have strived to provide residents and business owners in the Salem area with high-quality roof repair and replacement solutions.